These RGB LED Strip Solderless Quick Connectors are designed to connect 2 RGB LED strips together. 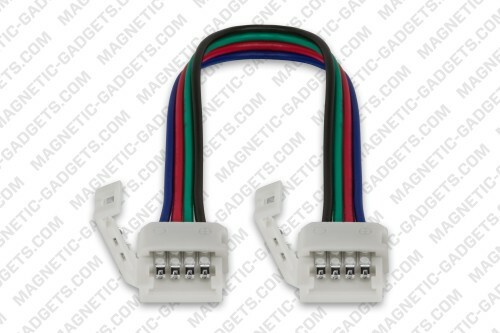 It’s the ideal connector to extend a LED strip or to go around a corner without having to bend and twist your LED strip. These RGB Solderless LED Strip Quick Connectors are now available in lengths of 1 and 2 meters. 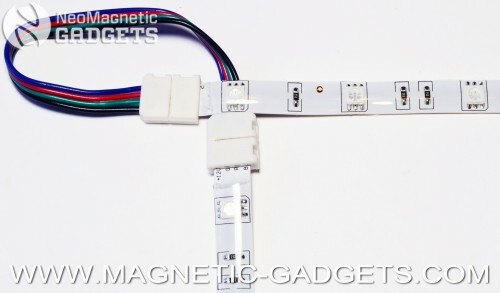 These longer connectors are ideal to connect different sections of LED Strips for under cabinet lighting projects. It’s the perfect type of connector to go around a range hood, a window or any other type of obstacle without having to use a soldering iron. If you need a custom length, you can simply buy the 17cm version, cut the wires between the connectors and extend using RGB wires.